African Americans have a long-standing tradition of grave decoration. As part of this burial custom, African Americans would decorate the dead’s grave with objects referred to as grave goods. These assorted objects are placed on the graves in belief that they will honor and represent the spirit, protect the spirit, guide the spirit to the ancestor world to prevent it from haunting the living, and satisfy the spirit. 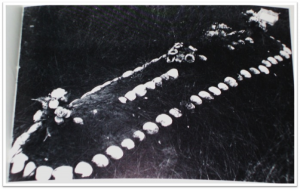 The Africans of the Congo introduced this tradition of decorating graves with grave goods to America. 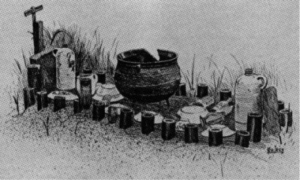 They did this by using pots and shells as grave goods to signify certain statuses or traits, honoring and protecting the spirit. This tradition has continued through the twentieth century and has evolved over time. These material objects have developed from pots and shells to face jugs and memory jugs to personal items of the deceased to bottles, and finally to death masks. To the unknown observer, these materials could seem like junk but to family and friends of the departed they represent the person buried at that spot. The death masks are a twentieth century representation of this age-old African American tradition. The African American artist behind these works was Isaac Nettles Sr. (1885-1957). 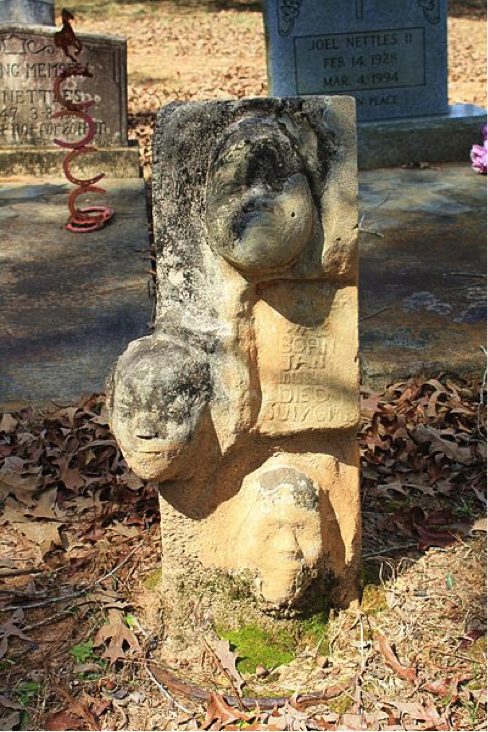 He was a little known inventor who created these four death mask headstones that lie in Mt. 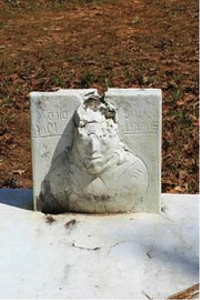 Nebo Cemetery in Clarke County, AL. The death masks are concrete “masks” of the subjects that were cast when they were still alive. Three of the four death masks are cast of Nettles’ family members and the fourth is of Manul Burell, a community resident. These death masks are a unique representation of the timeless tradition of African American grave decoration. The death masks both mark a sacred burial spot of the dead and represent the deceased in an eternal way. They represent a combination of all of the versions of the African American grave decoration tradition. This exhibition shows the different representations of an ancient African American burial tradition in the twentieth century. Unknown Artist, A Congo Chieftain’s grave, ca. 1830, West Central Africa. Century Magazine, Vol. I. This is the grave of a Congo chieftain in West Central Africa. The image was drawn by a white man who was visiting and observing the Congo in the early nineteenth century. This picture is a great example of typical Congo grave decorations that inspired the African American grave decorating traditions. The grave is bordered by bottles that are partially buried in the ground. According to Congo tradition, the mound is surrounded by bottles to keep evils from the spirit and the spirit from wandering into the living world. There is also a large pot, bottles, pitchers, plates, and cups, lying on top of the grave. Most of the items on the grave are broken. This is due to the belief that the broken items will release the spirit of the dead, allowing it to travel to the next world and serve its owner. Afro-American burial enclosed in seashells, 1975, South Carolina. Attributed to Unknown African American slave, Face Jug, ca. 1850. This ceramic face jug was discovered in the mid-1800s in the South. Enslaved African Americans made bricks and pottery for use on the plantation and in their spare time, they created these jugs with faces. They usually used white clay on the dark clay of the jugs to make the human eyeballs and teeth but sometimes they would make sharp jagged teeth out of discarded pieces of porcelain. The exact reason for the creation of these jugs is not certain but it is highly is speculated that they were made for African American burial purposes. Attributed to an African American slave, Face Jugs, Edgefield, ca. 1850, South Carolina. These jugs were significant because it is thought that African Americans made these face jugs for burial decorations. The belief was that their intense and crude facial features would ward off evil from the grave. Many of these jugs were found at African American burial sights or along the Underground Railroad, showing how highly valued they were in the African American culture. The use of the jugs also progressed. They eventually became popular for the sale of moonshine because the details on the jugs stood out from the others on the shelf. 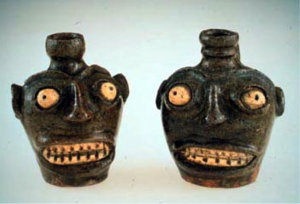 The extreme and ugly facial expressions on the jugs also kept children from touching them. Memory jugs were a very personal form of grave goods that represented the life of the dead. The jugs were first covered with a layer of putty or cement and then embedded with items such as rocks, buttons, glass, and small personal items while the adhesive was still damp. These items either belonged to or represented the deceased. The jugs were then placed on their grave to commemorate them. These personal connections to the items on the jug were thought to help embody the spirit of the dead and keep it alive. Asberry Davis, Untitled, ca. 1950, South Carolina. Davis was born in Hampton County, South Carolina. He had very little education and little is known about him. Asberry Davis dedicated this grave decoration to his mother. He created this pile of grave goods by turning a chair upside down on his late mother’s grave and placing her clothes on top of the chair. The over turned chair is significant because it symbolizes the inverted nature of the spirit world. African ancestors believed that the spirit could become restless in the grave because they may get irritated if others were handling their personal belongings. They believe that if this happens the spirit may return to the living world to collect their possessions. 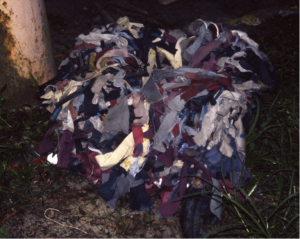 To prevent this family members, like Asberry, often decorate their loved one’s graves with personal belongings to satisfy the spirit’s possessive behavior. 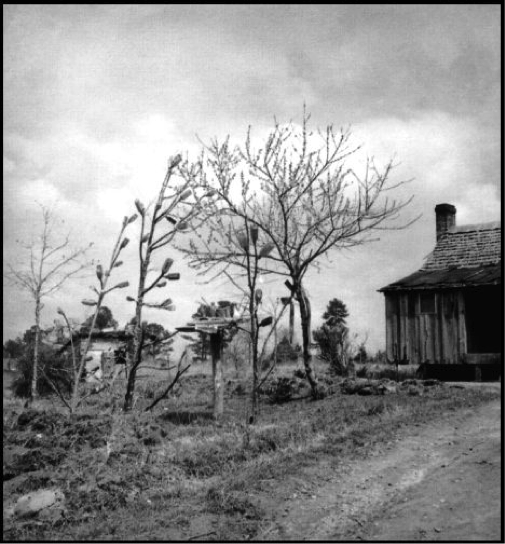 Bottle Trees, 1997, Bibb County, Alabama. Congo-derived bottle trees, such as this one, are trees “garlanded” with bottles and other vessels to protect the household through the “invocation” of the dead. Tradition says that if you hang bottles on trees, they will protect your house or property from evil, repelling or trapping the “malevolent” spirits into the bottles. The bottles and objects that are hung from trees surrounding the home are to have been used by the people who have died. This is because the objects that were used by the deceased are thought to preserve the power of the spirits of the people who died, and the glass bottles are said to “preserve their talents and skills from fading away”. Isaac Nettles Sr. grew up in Clarke County, Alabama and was a little known African American inventor and self-taught artist. Nettles created these masks by having his subjects press their faces in a box of sand while still living, making a mold of their face. From this mold he cast “masks” of concrete, paper, and wire. This particular sculpture is the mask of his family member, Ezella Nettles. These masks are Nettle’s own form of African American grave decoration. 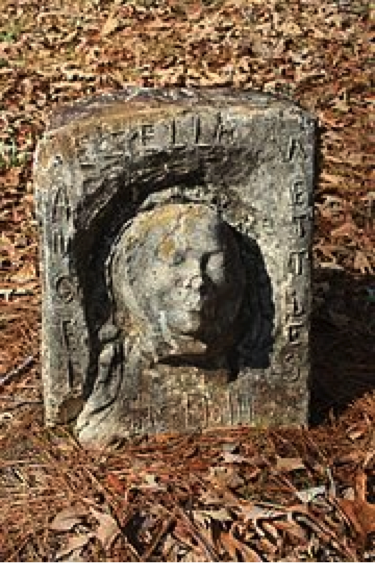 This headstone contains the faces of Nettles’ three daughters, Pauline, Marie, and Clara. Although his daughters faces are on this headstone, it marks the burial site of his wife, Korean, who died in 1933. It appears that Nettles had at one time placed hair on the bust of some of these statues, attempting to add realism to the faces. 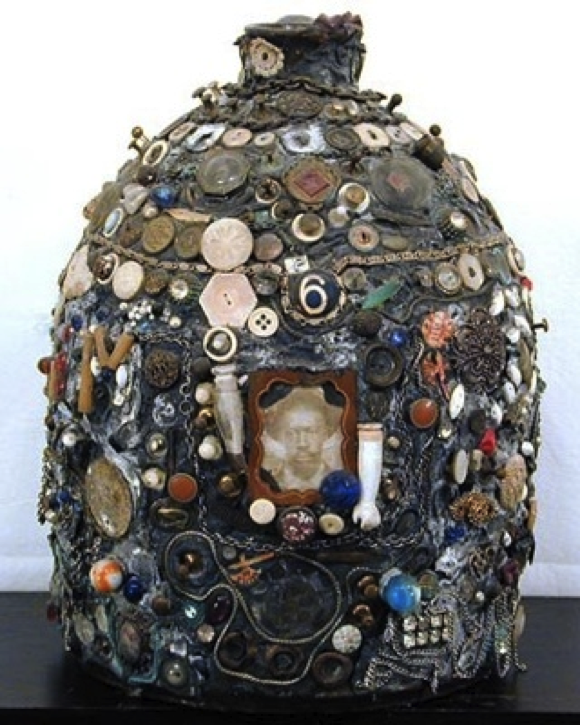 This displays his creativity and use of personal items in art. Isaac Nettles, Manul Burell Death Mask, 1933-1946, Mt. Nebo Cemetery, Clarke County, Alabama. 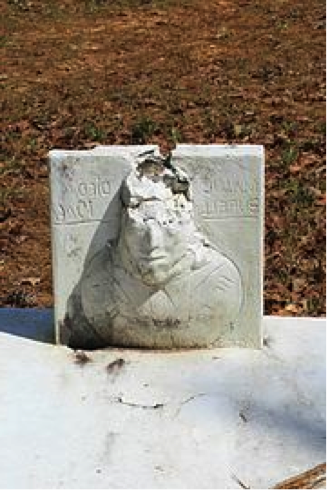 This third headstone of Nettles’ contains a crumbling face of a local man named Manul Burell who died in 1946. Nettles was able to sculpt a button down shirt on this death mask making it a bit more detailed and showing the development of his skills. He also personalized Burrell’s death mask by hand inscribing, “He Is At Rest”, across the chest. Nettles originally made four death masks, the fourth was of his mother, Selena, but only three remain in tact today. Each of the unique items in this exhibition display the different traditions and beliefs of African American grave decoration. Most of these traditions were adapted from the Congo Africans when they arrived in America. These burial customs mainly consist of placing grave goods upon the resting spot of the dead. African Americans used these grave goods as a type of headstone for their loved ones’ graves. Although some of these grave decorations may look like junk to outsiders they have many different significances for African Americans. 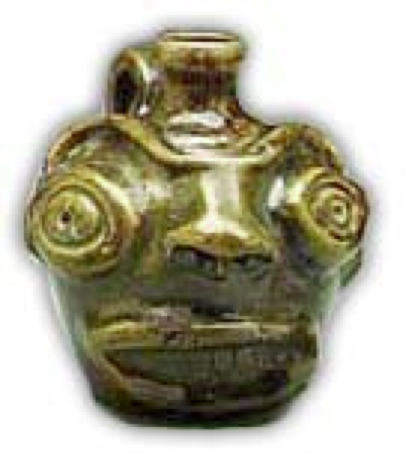 Grave decorations such as bottles, shells, and face jugs were important because they were believed to protect the spirit by warding off outer evils. Other objects such as personal items of the deceased and memory jugs were placed upon the dead’s grave to keep their spirit at peace. They also commemorated the dead and the lives they lived. As the tradition continued, some grave decorations such as the death masks of Isaac Nettles combined the aspects of several grave goods. In his masks, he used the “frozen face” aspect to immortalize the departed and capture part of their spirit, freezing it for all eternity. The “frozen face” was meant to protect the dead by intimidating evil spirits and scaring them off. He also used personal items such as hair to represent the spirits and satisfy them in the afterlife. Isaac Nettles’ death masks embody a combination of grave goods and are a twentieth century representation of this African American tradition. of the South. Vol. 1. Tinwood Books, 2000. Burrage, Joyce White. Clarke County. Charleston, SC: Arcadia, 1998. Ferris, William R. Afro-American Folk Art and Crafts. Boston, MA: G.K. Hall, 1983. Anthony B. Pinn. ABC-CLIO, 2009. Historical Archaeology 29 (1995): 39-58. Mytum, Harold C. Mortuary monuments and burial grounds of the historic period. Park Service, n.d. Web. (February 2014). Thompson, Robert Farris. Flash of the spirit: African & Afro-American art & philosophy. Wertkin, Gerard C., ed. Encyclopedia of American folk art. Routledge, 2013.
. Ross W. Jamieson, “Material culture and social death: African-American burial practices,” Historical Archaeology 29 (1995): 49.
. Robert Farris Thompson, Flash of the spirit: African & Afro-American art & philosophy (Random House LLC, 2010), 132.
. John Michael Vlach, The Afro-American Tradition in Decorative Arts (Cleveland: Cleveland Museum of Art, 1978), 142.
. Joyce White Burrage, Clarke County (Charleston, SC: Arcadia, 1998), 64.
. National Register of Historic Places Registration Form, Digital image, Nps.gov, National Park Service, Web (February 2014): 2, http://pdfhost.focus.nps.gov/docs/NRHP/Text/00000141.pdf.
. Thompson, Flash of the spirit,139.
. Ross, “Material culture and social death,” 51.
. Jamieson, “Material culture,” 50.
. Gerard C. Wertkin, ed., Encyclopedia of American folk art (Routledge, 2013), 314.
. William R. Ferris, Afro-American Folk Art and Crafts (Boston, MA: G.K. Hall, 1983), 37.
. Arnett and Arnett, Souls Grown Deep, 297.
. Stephen C. Finley and Torin Alexander, African American religious cultures, ed. Anthony B. Pinn (ABC-CLIO, 2009), 668.
. Thompson, Flash of the spirit,142.
. Paul Arnett and William Arnett, eds., Souls Grown Deep: African American Vernacular Art of the South (Tinwood Books, 2000), 87.
. Arnett and Arnett, Souls Grown Deep, 40.
. National Register of Historic, National Park Service, 2.
. National Register of Historic, National Park Service, 3.
. Burrage, Clarke County, 64.